Last week I had the privilege of speaking at a Worldview Conference sponsored by Precept Marketing and BJ Press. 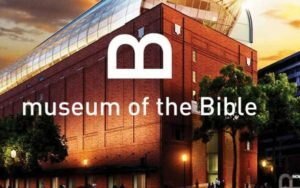 It was held at the beautiful Bible Museum in Washington, D.C. and included other speakers such as Jeff Keaton and Dr. Josh Mulvihil of Renewantion, Dr. Bryan Smith, Ben Schetler, and Dr. George Barna. I came away from the conference deeply burdened about the condition of today’s church and society here in the United States. If you have been following my blogs over the past several weeks, you know that my concern for our children’s future isn’t new. I first wrote about this in the blog, For the Sake of Our Children. I encourage you to take the time and click on the title and read it again. Following that post I realized that Christians must repent of our sinful actions of giving our children a secular worldview education. Two verses have been on my heart and mind ever since. In each of my blogs since then I have been challenging readers to examine their lives and apply Joel 2:12-13 to their lives and ministries. I suggested that today, April 23, 2019 be the day that we individually and collectively turn to the Lord with our whole heart. Last week’s conference burned this conviction deeper into my heart. Each presentation built on the others as if all of the speakers had met and collectively planned what would be said. I left DC with several key realities weighing heavy on my heart. Today’s church is a better reflection of today’s culture than it is of biblical Christianity. Christianity is facing a crisis of belief! The majority of Christian adults are biblically illiterate compared to previous generations. Less than 10% possess a biblical worldview. Today’s church is a better reflection of today’s culture than it is of biblical Christianity. Younger generations have developed a secular worldview that is driving their actions and attitudes! It is a myth to believe that there is a body of neutral facts that can be taught without spiritual implications. It is believed that only 4% of Millennials have a biblical worldview and 51% of them desire to live in a socialistic or communistic society. The younger generations are more likely to support various lifestyle positions that go contrary to the Bible. The worldview of every generation is a result of the education that they received! The main business of all education is the communication of ideas. All educational efforts take place in the context of the teachers’ and textbook authors’ worldview. The mission of all education is to instill a biblical worldview or a secular worldview in the hearts and minds of the next generation. There is no such thing as neutrality! It is a myth to believe that there is a body of neutral facts that can be taught without spiritual implications. This is true at home, church and school. Education can have only one of two missions! The education that a child receives at home, church and school will have the mission to instill a biblical worldview or a secular worldview in the hearts and minds of the next generation. The home, church and school must be united in giving children and youth a biblical worldview education! A divided kingdom cannot stand. This is true when it comes to the education that the next generation receives. There must be unity in beliefs and values if the current trends are going to be reversed. It is now believed that a person’s basic worldview beliefs are pretty much set by the age of 13 or 14. Today’s society is definitely secular which means that religion, specifically Christianity, has no place in the public square. It has taken decades of secular education to get us to the condition that can be clearly seen in today’s culture. We have heard the statistics for years of how the majority of our young people are leaving the church in their teenage years — many of them will never return. Even though the future looks bleak, we must remember that with God all things are possible. It isn’t too late for God to work. However, it is going to require certain things of parents, church leaders and educators. We don’t need better facilities, programs or teaching methodologies. It isn’t going to be accomplished by improving technology or chasing after the latest fad. 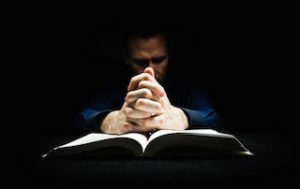 It will only happen if parents, church leaders and educators rend their hearts and turn to the Lord their God with fasting, weeping and mourning! We must get back to following God’s instructions on how to educate future generations! The Old Testament provides us with powerful truths that we must understand and grasp. Today, there are some who believe that the Old Testament is outdated and Christianity can simply focus on the New Testament. However, Paul explains that we can learn a lot and avoid making serious mistakes by carefully studying the accounts found in the Old Testament. The account of the people of Israel desiring to have a “god” of their own is familiar to most Christians. When Moses was up on the mountain getting the law from God, the people got anxious when he didn’t return right away. Instead of waiting on the Lord, they decided to take matters in their own hands. The people pressured Aaron into making something that they could worship. Aaron took gold from the people and made a golden calf that they could worship. I find it amazing how Aaron tried to avoid taking any responsibility in making this false idol. When Moses questioned him about what he had done, Aaron came up with one of the most unbelievable tales. He tried to say that this idol just appeared out of thin air. 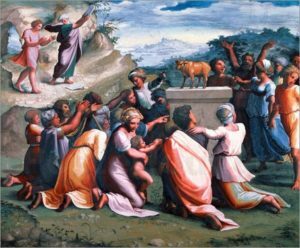 Aaron simply took the gold that the people gave him and threw it into the fire and miraculously out popped a golden calf. Most of us are familiar with all of this but it is what took place after this that I want to focus on in this week’s post. God was angry with the people and He told Moses what he needed to do. Moses was actually saying to God that he would rather stay in the wilderness with God than be in the land of milk and honey without God. God told Moses to go ahead and enter the Promised Land. However, I am not going to go with you because if I do, I might destroy the people because of their idolatry. It is at this point that Moses shows amazing wisdom. Listen to what Moses said to the Lord. Moses was actually saying to God that he would rather stay in the wilderness with God than be in the land of milk and honey without God. Wow! I wonder how many of us would have taken the stand that Moses took. How many of us would have looked at the options and maybe made a list of pros and cons and decided let’s get out of this forsaken place and head to the Promised Land? I believe that just about everyone reading this blog has a vision for the future. Most of us have some goals we want to accomplish in the immediate and distant future. We want to be successful in both our lives and our ministries. Parents want their children to be successful and enjoy life. Teachers want their lessons to be effective and bring about transformation in the lives of their students. Administrators want to see their schools grow and accomplish more than what they are right now. 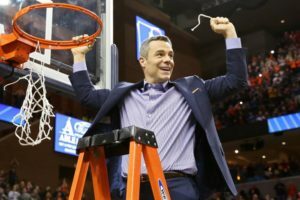 Coaches want to experience success and may even win a state championship. Pastors want to see their churches grow and impact the community for Christ. God, don’t move us one step forward if You don’t go with us! I could go on and list many more things you and I want to accomplish. Maybe it would be good if you would make a list of your dreams for your life, your family, your ministry and your church. Once you did this, what would you do if God were to say to you, “Go after your dreams and accomplish all your goals? However, I won’t go with you so that I won’t consume you because of your idolatries. if you do not go with us? This is difficult to try and comprehend but that is exactly what Moses said to God. Moses knew that God’s presence was the most meaningful thing that one can experience in life. Any other advances, victories and blessings that might come our way here on earth are completely meaningless if God is with us. As we prepare to turn to God with our whole heart on April 23rd, let’s have the conviction shown by Moses. God, don’t move us one step forward if You don’t go with us! 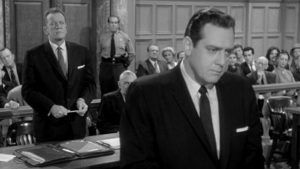 I am a fan of the old TV program, Perry Mason. I enjoy watching this defense attorney cleverly outwitting Mr. Burger, the DA, and Lt. Tragg and identifying the real people who were guilty in each case. There was one theme that occurred regularly on Perry Mason. The general story line went something like this. A well-to-do person would be disappointed in how one of his own children behaved. Because of this disappointment, the parent, usually the father, would take stern action toward his wayward child. The form of discipline that the father would take toward his child would include either giving the family business to another person, or taking the son or daughter out of his will, or even banishing the child from his home and presence. The father believed he had to take this type of action because of the recklessness by which his child was behaving. The child had brought dishonor to the family name and this wasn’t going to be tolerated. It is easy for a person or an organization to call itself Christian. It is far more difficult to live up to what God expects from a person or group that calls itself Christian. Recently, I was watching one of Mason’s cases that involved this type of story line. As I tried to figure out who was the guilty party in the episode, the thought hit me about how God must feel as He watches His children live their lives today here on earth. I started wondering if God was broken-hearted by how one of His children or a local church or Christian school was behaving. Would He have to take serious action toward a wayward child or organization because His name was being maligned? Over the past couple of weeks, I have pointed out some of the horrendous things that are taking place in the culture today. I have explained how we must recognize the fact that much of the fault for the condition of society must be laid at the feet of people and organizations who carry the name Christian. It is easy for a person or an organization to call itself Christian. It is far more difficult to live up to what God expects from a person or group that calls itself Christian. God will not tolerate anything that might bring dishonor to His name. This is evident throughout the Scriptures, especially in the book of Ezekiel. God took severe action toward His children because of how they mistreated His name. It started in their homes. It didn’t take long before what they were practicing in their homes carried over into the culture. When this happened, God took action. However, the reason behind His action is important to understand. He didn’t act on behalf of His children. There was something of greater importance that caused God to act. As we prepare to turn to God on April 23rd, I believe that individuals, families, churches and Christian schools need to examine themselves. Have I, as an individual Christian, dishonored God’s name in any way? If so, what ways have I done this? Have we as parents brought disgrace to God’s name in some way? If so, how have we done this? In what ways has our church profaned the name of God in our community? Has our Christian school caused God’s name to be dishonored? If so, what ways has this been done? These are difficult questions that must be asked and honestly answered. If we don’t do this, will God have to take severe action, not for our sakes, but for the sake of His great name? If you are a KEM Prime Member, I want to encourage you to watch a couple of videos that can be applied to today’s post. These have just been uploaded and you can find them under the heading, Kingdom Essentials. They are lessons # 31&32. Again, if you are not a KEM Prime Member, this would be a good day to become one. When a school or church becomes a KEM Prime Member, the entire staff and board members have access to all of the resources available. Join with more than 150 individuals and/or schools that are now KEM Prime Members. Click here to learn more! Have you observed that when an individual, family, church or school drifts, it is never in the right direction? When there is drifting in a relationship, it is said that the people involved are drifting apart. We constantly hear of an organization experiencing mission drift. Drifting will always happen when there is a loss or slide away from one’s purpose for his/her existence. This is true for a family, church, school or community. If life simply goes on according to what comes naturally, there will always be a drifting away from its ultimate purpose. When an individual, family, church or school drifts, it is never in the right direction! A common definition of drifting is a gradual shift in attitude, opinion, or position. Drifting is gradual and, most times, people do not even know it is occurring. The longer that a person or organization drifts, the farther off course they will end up. This is especially true for Christians and Christian organizations. Consider what Dr. Ed Stetzer recently said. Nobody drifts toward theological orthodoxy. It is interesting that we never hear of a Christian school drifting toward God. Instead, the educational landscape is littered with schools that were once strong, God-honoring and biblically-grounded institutions and now have no semblance to the truth of Scripture. Unfortunately, we have the tendency to only see drifting that takes place in another person’s life or another church or Christian school. We seldom see that we are drifting or our church or school is drifting away from its moorings. The reality is that Western Christianity has been adrift for several decades. If we are going to turn to God with our whole heart, we must first admit that we are not where God wants us to be. Once we recognize that we have drifted away from the Lord, we must try to pinpoint when and where the drifting began. This is true for our individual lives, families and churches and schools. Whenever I have gotten off course, I have to back track to the point where I started to drift. Then I have to intentionally get back on the right course and be disciplined to stay on the correct path. The educational landscape is littered with schools that were once strong, God-honoring and biblically-grounded institutions and now have no semblance to the truth of Scripture. I have heard from many readers that they are committed to turning to God with their whole heart. I challenged readers in recent weeks to determine in their hearts to turn to God on April 23rd. As we prepare to turn back to God, it is important we understand God’s main purpose for our existence. Again, this is true for an individual, family, church or school. In the hectic rush of everyday life it is easy to forget why God created this world and then made man in His image. It is critical that we know that God’s purpose behind all of creation was to express Himself for His glory (Romans 1:20; Psalm 19:1-3). My life, family and ministry should be committed to glorifying God in all that I think, say and do. I encourage you to examine your life and see if you have drifted from God’s purpose for creating you. Then, we need to examine our home life and try to identify any drifting from God’s purpose that has taken place. Church leaders and Christian school staffs should sit down and look at all of their programs and see if there has been any mission drift that has taken place. As God shows us areas of our lives and ministries where mission drift has taken place, we need to return to where the drifting started and get back on the correct path. We never hear of a person, church, or Christian school drifting toward God. If you or your school is a KEM Prime Member, I want to recommend that you watch four videos over the next couple of weeks. These 30-minute videos will help you remember what is God’s ultimate purpose for our lives and ministries. You will find these videos under the Kingdom Essentials heading. They are Lessons 3-6. If you are not a KEM Prime Member, I encourage you to consider membership by clicking here. If we haven’t been intentional in being all that God intends us to be, we probably have drifted off course. Let’s go back to where the drift started and be determined to get on the correct path! It is critical that we start today! I want to thank several readers who shared passages of Scripture in response to last week’s blog. Keep the comments coming. Also, there have been several new subscribers to these weekly blogs. If you are one of these people, thank you for signing up. I encourage you to read the last 4-5 posts in order to better understand the purpose behind this week’s blog. Last week I shared how we must obey Joel 2:12 and return to God with our whole heart. I challenged readers to set the date of April 23, 2019 as a day for us to do exactly that — turn to God with our whole heart. Between now and then I believe it is important that Christians individually and corporately prepare themselves for this day of turning. 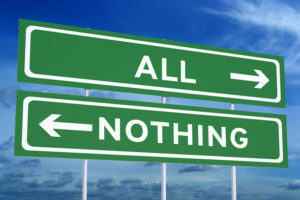 To begin this effort, it is important to understand that with God it must be all or nothing! God does not want a half-hearted effort to turn to Him. He demands our whole heart. Here are some verses that we can meditate on as we prepare to turn to Him with our whole heart. Here are some suggestions that might help us examine and prepare our hearts to turn to Him. God does not want a half-hearted effort to turn to Him. He demands our whole heart. How does keeping God’s testimonies relate to seeking Him with my whole heart? Do I love God like He tells me to in Deuteronomy 6? What might I love more than God at times? How do I search for God with my whole heart? When I don’t search for Him with my whole heart, what things am I searching for? Discuss these verses and questions with other Christians. Church staff members can discuss how this relates to their church. Christian school educators can ask themselves these questions from their school’s perspective. An example of doing these two points above could be something like “is our school/church seeking God with our whole heart?” Do we as a school/church love God more than anything else? If not, what other things may be competing for our school’s love? Finally, I want to encourage everyone to share other verses that can help us understand that it is all or nothing! You can do this my leaving Scripture references as a comment below or simply email them to me at glen@kingdomeducation.org. Have a great week seeking and loving Him with your whole heart. This week I have shared a series of posts about our need to follow God’s instructions that He gave His people through the prophet Joel. God wants each of us to turn or return to Him with all of his/her heart. It must be done now and it must be a total turn to Him with our entire lives. The question I wrestled with during this time of examination was this. 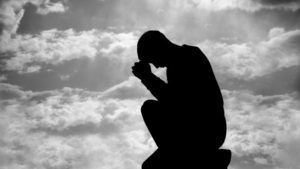 How do I know that I am turning to God? Here it is made clear that the Word was and is God! This means that if I want to turn to God, I must turn to the Word. I know God by studying His Word. When one realizes this, it means that we must turn our entire heart or life to the Word. We must search the Scriptures to find out what it says about every area of our lives. Then, when we do this, the determining factor of whether or not we are turning to God with our whole heart is our willingness to obey what the Word tells us. Over the next couple of weeks I will be sharing some of what God’s Word has been teaching me about what I need to do in order to turn to God with my whole heart. At times I will be suggesting that those who are KEM Prime Members review specific articles and/or videos to help with this effort to turn to God with our whole heart. If I want to turn to God, I must turn to the Word. I know God by studying His Word. There are people who receive these blogs from all walks of life — pastors, parents, administrators, business men and women, school teachers, coaches, etc. I am praying that these different groups of people will get together with others in their homes, churches or schools and discuss what God begins teaching them as we search His Word. Here are some questions that I believe we have to answer if we truly want to turn to God with our whole heart. What does His Word tell me that I must change in my personal life in order to turn to God? What does His Word tell me that I must change in my home life in order to turn to God? 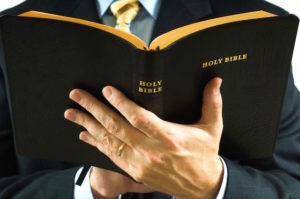 What does His Word tell me that has to change in my church in order to turn to God? What does His Word tell me has to change in my stewardship of my time, treasure and talent if I want to turn to God with my whole heart? What does the Word tell me has to change in my relationships if I am determined to turn to God with my whole heart? What does the Word tell us that need to change in our school if we, as Christian educators, are going to turn to God with whole heart? The same thing can be asked by church leaders related to their ministries in their churches. Throughout the Old Testament when God was going to do a great work in the lives of His people, He required them to take certain amounts of time to consecrate or prepare themselves so that He could do His will. I believe that if we are really serious about turning to God with our whole heart, we must also take time to consecrate ourselves. Most of the people who subscribe to these blogs are from the United States (even though 8 other countries are represented). Over the next few weeks, schools will be taking their spring breaks and everyone will be looking forward and preparing for Resurrection Sunday on April 21st. God has impressed it on my heart to suggest that April 23rd be set as a day of turning. What would happen if the 1,200+ subscribers to these blogs would share this week’s posts with everyone in their circle of influence? Then, what would take place in our homes, churches and schools if all of us would take the next several weeks and prepare their hearts and minds so that we could all turn to God with our whole hearts beginning on April 23rd. During this time of preparation, God may lead you to observe some times of fasting over various areas of your heart. Other times may be times of weeping and/or mourning. Changes will probably take place in our lives before April 23rd but that date could be a target date when we corporately go to God and surrender our whole hearts totally to Him. I am not going to try and develop a process or certain steps that everyone has to follow. I believe that God will show each person what is required of him/her to turn their whole heart to Him. I have become convicted that it must start with me and hopefully spread to others. It is absolutely necessary that we each turn to God with our whole heart. If for nothing else, we must do it for the sake of our children! today’s Christians are the most biblically illiterate generation in many years. 65-80% of teens in the church today will walk away from the faith within two years of high school graduation. Western Christianity has become compartmentalized into the sacred and secular. Because of this dangerous condition, we find it hard to turn to God with our whole hearts. The only hope for seeing our current condition change is what God said through the prophet Joel. In these two verses, God tells us that we must turn and/or return to Him with our whole heart. If a person turns, it means that he/she has to change direction. The need to change direction implies that the person is going in the wrong direction. The direction of our lives must change — either by a turn or a complete u-turn. 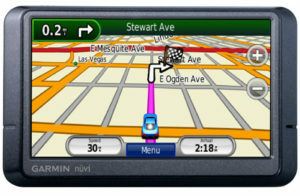 When I am driving to an unknown destination, I use a GPS system. This technology is fantastic. All I have to do is enter my final destination and the GPS will map out the best route to take to get there. Now I can get the route that I need to take and I can study the details of the route. I can see every turn that I have to make and the distances between each turn. I can start driving and hear the voice programmed into my system tell me to make a right turn in 500 feet. When I get to the turn, it will say, “turn right now.” I can even look in the direction I am supposed to turn and see where that road goes. However, I will never get to my destination by just studying the route or looking at the turn. I must turn the wheel of the vehicle and make it turn at the right place. Sometimes we do the same thing with God’s directions. We can study all the directions that God is telling us we need to follow in Joel 2 in order to get to where God wants us to be. We can actually get to an area of our lives where God says turn now. But until we actually turn and change the direction of our lives, we will never get to the right destination. These verses tell us that we must turn to God now. We can’t just know what the verses say; we must actually change direction. God also says that we must make the turn to Him with our whole hearts. God wants our entire life to change direction — not just one area of our lives. To change course requires a whole heart change. When we turn to God with our whole heart, it will impact everyone we influence. I do a lot of travel by air. When I lived in Nashville, TN, I usually flew to my destination on Delta airlines. At the time, Delta had flights from Nashville to Atlanta, Cincinnati, New York City or Orlando. When the boarding of the plane was complete, a flight attendant always made an announcement that went something like this. Welcome to flight number ___ to (one of the four cities Delta flew to). If (that city) is not your destination, please deplane now. It was important that every passenger paid careful attention to that announcement. There were a couple of times that a person would realize that he/she was on the wrong plane. Once the boarding door was closed, the plane pushed away from the gate, and taxied down the runway to take off, everyone on the plane was going wherever that plane would go. If that plane was going to Atlanta, everyone on board had to go to Atlanta. When the pilot banked the plane to the left, all the passengers would go to the left. The entire plane went in the direction that the pilot took the plane. So it is when you and I turn our whole heart to God. Every part of our lives will go with us. My life has a lot of passengers. I have family passengers. I also have work passengers. When I teach, I have student passengers. I have financial passengers, etc. If I turn to God with my whole heart, it means that I need to turn all of my passengers to God. It is not enough just to turn part of my heart to God. He demands I turn my whole heart to Him. Western Christianity has become compartmentalized into the sacred and secular. Because of this dangerous condition, we find it hard to turn to God with our whole heart. We will turn to God with our Sunday heart. However, our work, finances, recreation, education etc. are considered secular aspects of our lives and we don’t see a need to change where we are going in those areas — especially if we think we are “successful” in these areas. It is not enough just to turn part of my heart to God. He demands I turn my whole heart to Him. This is why this type of course correction will include fasting, prayer and mourning. It is hard and it is costly. It requires brokenness and complete surrender to God. But it is what must be done. There are some questions that I have been asking myself regarding what God expects of me if I want to turn to Him with my whole heart. Do I need to turn my personal, private life to Him? Does that mean more time with Him studying His Word and in prayer? Are there areas of my family life that I need to turn to Him? What are they and what will it take? 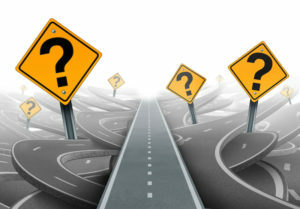 Do I need to make a course correction with my finances? Have I been faithful in giving God His tithe — the first 10% of all my increase? Do I need to make a course correction in how I educate my children? Is the education they are receiving turning them to or away from God? There might be other areas such as relationships, church involvement etc. that God may be telling you must turn to Him. God wants us to turn to Him with our whole hearts. Could God be getting ready to close the boarding door? Is He making the final announcement? If God is not your final destination, please deplane now! Tomorrow I want to suggest some things that you and I can do to TURN NOW! Yesterday I shared with you how God convicted me through His charge against His people, Israel, in the book of Hosea. God saw that the people had forsaken His law. Because of this, God could say that there was no truth, nor mercy, nor knowledge of God in the land. I explained that the “land” was not a geographical area but referred to the nation of Israel — God’s people. When one looks at the condition of the church in many places around the world, he/she would have to agree that God’s people have, once again, intermarried with the culture. The reality is that God can charge us with the same thing He charged Israel with in the days of Hosea. When one looks at the condition of the church in many places around the world, he/she would have to agree that God’s people have, once again, intermarried with the culture. Joel was predicting that the Day of the Lord will one day come when God will judge the world. Of course, if Joel was warning the people back then that this day of judgement is near, it means it is even closer now. I am reminded of what Paul wrote to the Christians in Rome. In both of these verses there is one word that hit me hard. That word was the word NOW! God didn’t say some day or when you have time; He said in both cases His people were to do something NOW. God has impressed on my heart that He demands that His people do something NOW for the sake of the children. We are to turn to Him with all our hearts. When we see the condition of the world and the church today, turning to God with our whole hearts will be accompanied by fasting, weeping and mourning. When we see the condition of the world and the church today, turning to God with our whole hearts will be accompanied by fasting, weeping and mourning. I must admit that I have had a lot of reactions to the terrible conditions I see in my country, my community, our schools at all grade levels, and our families. I have been sad. I have been angry. I have been discouraged. I have even been passive at times. But have these conditions broken my heart and led me to fast, weep and mourn? The answer is NO. I thought that I would end this week’s posting of blogs today. However, God has burdened my mind and heart so much about the seriousness of the situation and what He expects from His people I can’t stop with this post. So, I will be posting again tomorrow. In the meantime, here are some questions that I have had to answer about Joel 2:12-13. What does it mean to turn to God with my whole heart? How do I rend my heart and not just my garments? If my whole heart is my entire life, what makes up my life? Does it include my family? my work? my church? my friends? my writing and speaking? I encourage you to take some time and answer these questions for yourself. Tomorrow I will share about my take on an announcement I always heard flight make just before closing the boarding door. Tune in tomorrow for the announcement! 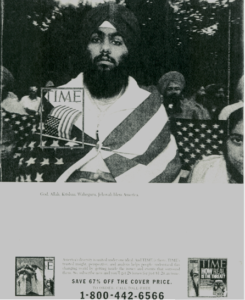 I realized that whenever I heard someone say, “God bless America”, they might be saying that any god can bless us because all gods are equal. It was at that time I came across this verse. That is quite a charge against God’s people. It gets even worse when you read what was common in the land at that time. Does this describe us today? Many people would say that this is true in our country today. However, God did not make this charge against a country in the general sense of the word. When God said in the land, He was talking about Israel. If we were to apply this verse to us today, it would read that there is no truth or mercy or knowledge of God in the church or the body of Christ. You might say that isn’t true in today’s church. The church knows who God is and it stands for truth and mercy. Before we brush this aside as not being relevant to today’s church, we need to consider some of the current conditions of the land. Here are just a couple of things that I have seen over the last few weeks. On February 25th, the US Senate defeated a bill that would require a baby that survived an abortion to be given proper care and not simply be allowed to die. The actual wording of the bill said this. Any infant born alive after an abortion or within a hospital, clinic, or other facility has the same claim to the protection of the law that would arise for any newborn, or for any person who comes to a hospital, clinic, or other facility for screening and treatment or otherwise becomes a patient within its care. It went on to state that whoever intentionally performs or attempts to perform an overt act that kills a child born alive…shall be punished as under section 1111 of this title for intentionally killing or attempting to kill a human being. By defeating this bill, the Senate actually approved infanticide. Then a mere 9 days later, some of the same people who voted against keeping a newborn baby alive made public appearances with an ash drawn cross on their foreheads marking the beginning of Lent. The real tragedy in all of this is that Christians are in many ways responsible for these people holding public office. Would watching this from the throne room in Heaven cause God to say, There is no truth or mercy or knowledge of God in the church? I recently watched an undercover video where a pregnant woman was talking with a counselor at a Planned Parenthood facility. When the woman asked if she would see the fetus when it was aborted, she was told no. When asked what would happen if the fetus showed signs of life at the time of the abortion, it was explained to her how the fetus would be placed in a jar of toxic liquid that would immediately take care of such a problem. Then the pregnant woman asked what should she do if, by chance, the baby would come out while at home. The response was simply, Flush it. When pushed further on what to do if it was born at home, she was told to put it in a bag and bring it to us and we will take care of it. Again, it must be noted that Christians have voted people into office who then voted to fund Planned Parenthood. Would this cause God to say There is no truth or mercy or knowledge of God in the land? This morning I read where a judge in another country ruled that a parent that tries to dissuade his/her child from transgender “treatments” is guilty of family violence. Another account was recently reported where transgender “treatments” (including injection of gender altering drugs) can be administered to children as young as 14 without parent consent. Many countries now require all schools’ curriculum to include the normalization of LBTGQ lifestyles. Even where this is not legally required, it is fast becoming a part of most secular educational programs in many countries and states. Yet, the majority of Christian parents still voluntarily enroll their children in schools where they will get this and other forms of anti-Christian teachings on a daily basis in almost all their courses. Do you think that God might have to say, There is no truth or mercy or knowledge of God in the land? The divorce rate in “Christian marriages” is no different than the divorce rate in non-Christian marriages. When one considers what God says on this subject and its impact on children in Malachi 2:13-16, would God have to say, There is no truth or mercy or knowledge of God in the land? A couple of weeks ago I wrote a blog highlighting the bold stand taken by an African pastor at the United Methodist conference that was recently held in St. Louis. Thankfully, the church leaders of this denomination voted to stay true to the biblical teaching on human sexuality, marriage and pastoral ordination. However, as I followed this with great interest, I was dismayed when I read that the vote to stay true to Scripture was 438 (53%) to 384 (47%). When only 53% of a denomination’s leadership stand on the side of Scripture, there is cause for concern. I also read several statements made by some of the denomination’s leaders (pastors, seminary presidents, etc.) after the vote who said that regardless of the vote their churches/institutions were going to continue to be inclusive to all people. Does God have a charge against His church that would cause Him to say, There is no truth or mercy or knowledge of God in the land? I could go on with many other examples that demonstrate that today’s church is much like Israel was in Hosea’s day. God can easily say to you and me that there is no truth or mercy or knowledge of God in the land. When you go and read further in this chapter, you can understand what led God to bring such a serious charge against His people. Israel had rejected truth. The leaders, including the parents, were not teaching truth to the people. The result was that they were being destroyed. The consequences that come from rejecting knowledge/truth is very heartbreaking. Listen to what God says He will do when His people reject knowledge. Another translation states because you have ignored My law, I will ignore your children. The truth is that our children and grandchildren will always inherit the consequences of our generation’s decisions. This is clearly seen when God dealt with His people when they “voted” not to go into the Promise Land. Will our children wander in an anti-Christian culture because of our acts of unfaithfulness? Another translation says that their children would wander in the wilderness for 40 years and bear the penalty for your acts of unfaithfulness. I fear for my children, grandchildren and great grandchildren. Will they have to wander in a postmodern, anti-Christian culture and suffer because of my acts of unfaithfulness? This has caused me great grief throughout this entire week. I can’t get it off of my mind and have continually asked God, what must I do so that future generations don’t have to wander in the wilderness? This past Wednesday morning, I opened my Bible app on my phone to read the verse of the day. As I read the verse of the day, the words pierced my heart. That verse and several other verses that I have studied since then have caused me to clearly see what God wants me to do. Tomorrow I will share with you what I believe God wants from His people today. I believe that each of us must take the action I will outline in tomorrow’s blog, if not for anything else, for the sake of our children! Celina Williams on It Isn’t Too Late!